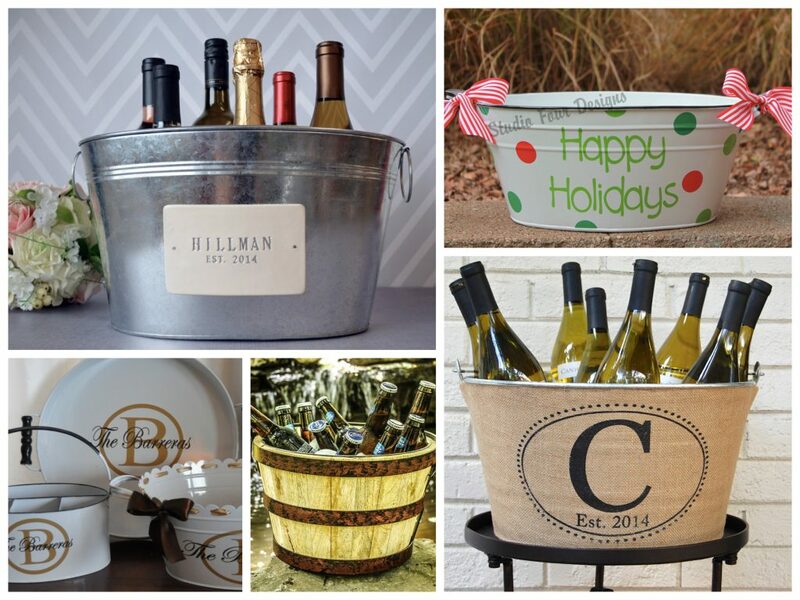 We have gathered together 20 of our favorite holiday business gifts. This list of the Best Company Holiday Gift Ideas Under $100.00 are organized from least expensive to most expensive and range from sweet cookie treats to celebratory champagne toasts to spa baskets and little somethings for your golfing buddies. There are treats for individuals, couples, and the whole family! All the gifts have been hand selected to reflect high quality products with lovely presentation designed to impress and delight your colleagues & clients. These are only a few of the many gifts available. If you don’t find something you like, feel free to email us and we are sure we can help you find the perfect something for your special business colleagues! Please Note: The shipping and tax costs will vary depending on the recipient’s location. 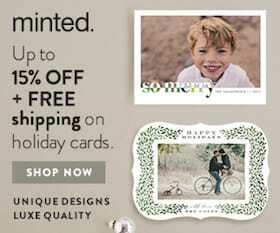 Also, if you are ordering gifts in bulk, one of our very favorite merchants, GiftTree.com makes it easy. 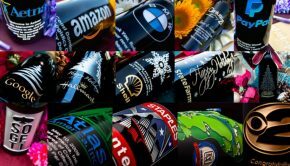 Not only can you brand your gifts, you can also upload their bulk order form. 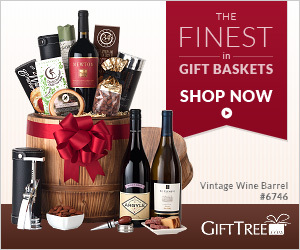 Also, be sure to take advantage of the GiftTree Promo Codes update & posted in the right sidebar! Finally, if you are in a hurry and are not in the mood to wade through this gift guide, our favorite holiday gift (or for that matter any time gift) is always a gift that keeps on giving long after the holiday decorations have been taken down and have been put away. 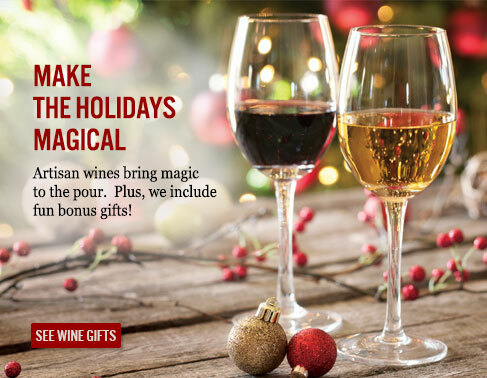 Gift a wine club subscription to clients, colleagues, and key vendors that help you day in and day out and play an important role in your success. 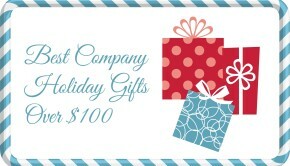 Ordering any of these 20 Best Company Holiday Gifts Under $100.00 is simple – just click on the picture or click here link to order a product! 1. A Little Something Sweet. The original cookie tower we absolutely loved is no longer available but there is no shortage of equally delectable options. We promise that whichever cookie or brownie gift you choose, your clients will remember how thoughtful and sweet you are! The Sea Salt Caramel Oreos sound particularly yummy right now. And how perfect for a family starting anew is the Giant Fortune Cookie with Personalized Fortune! Or send your clients all the fixings to bake their own sweet treats. Who doesn’t love making their new home smell like fresh desserts! 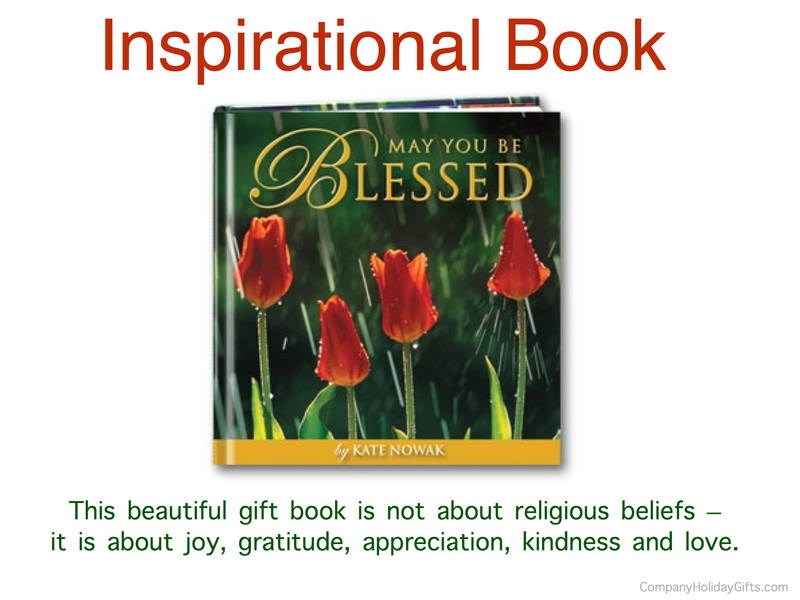 This beautiful gift book is not about religious beliefs – it is about joy, gratitude, appreciation, kindness and love. May You Be Blessed is filled with inspiring stories, beautiful photographs, and life changing insights, the perfect sentiments for a fresh start in a new home! 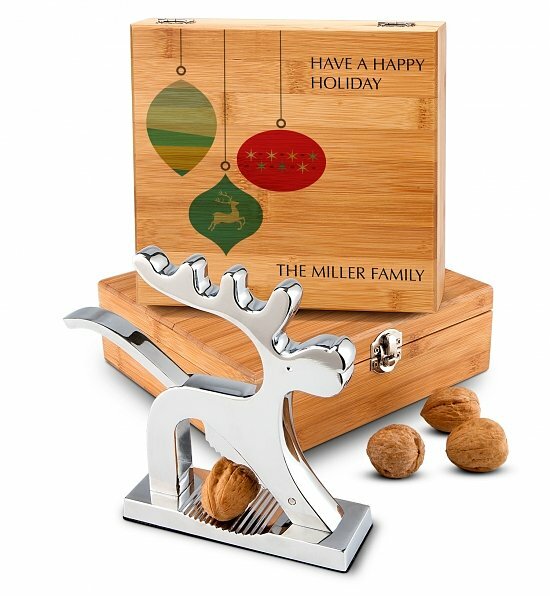 Send warm holiday wishes with this cheerful reindeer nutcracker in a personalized keepsake box. 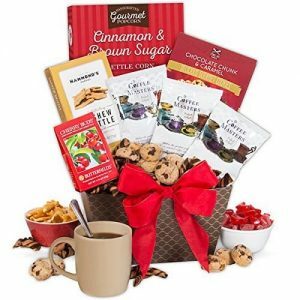 We love this Coffee Break Gift Set. 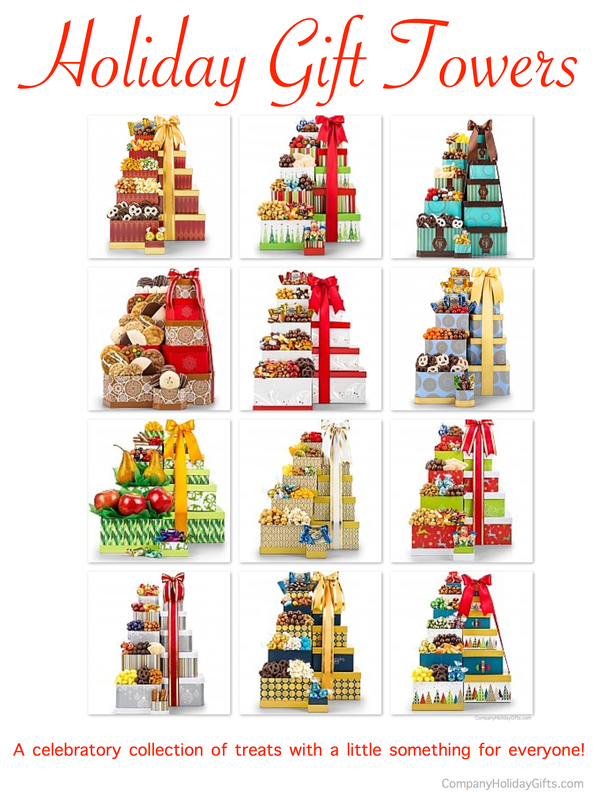 Choose any of these Gift Towers and your clients will be happy. 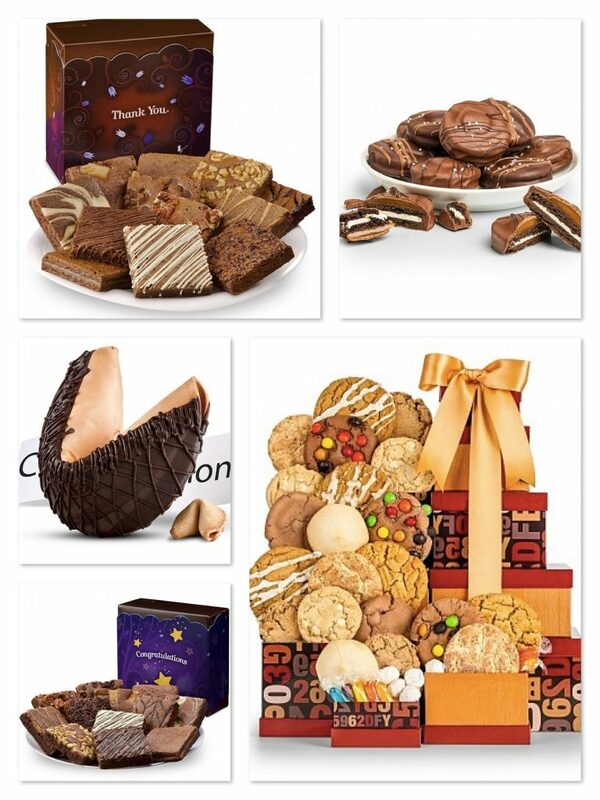 All the contents are delicious and unwrapping the package box by box is fun for the entire family. Gift contents & prices vary depending on the tower chosen. This gorgeous Marquis by Waterford Sparkle Vase is reduced 66% from $100.00 to just $33.79! Plus if you are an Amazon Prime member you don’t even need to pay for shipping. 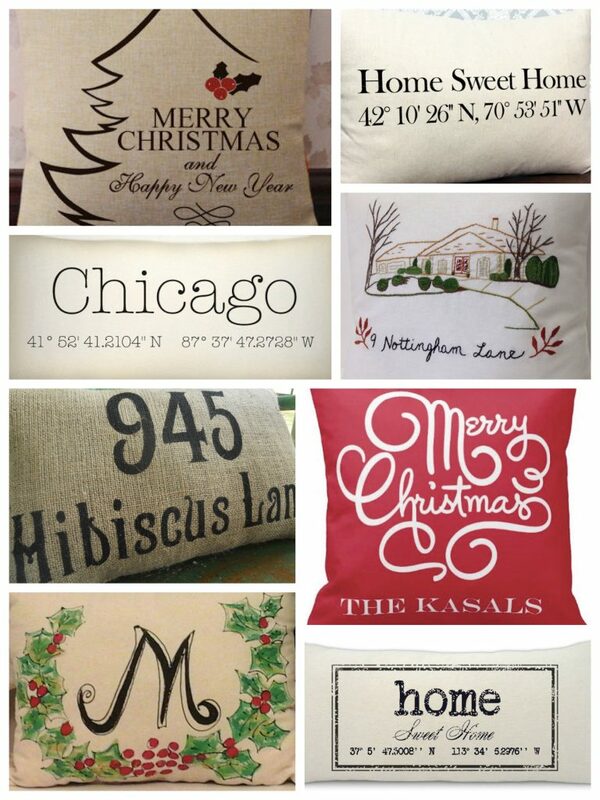 This really is a an amazing housewarming gift at a fabulous price! 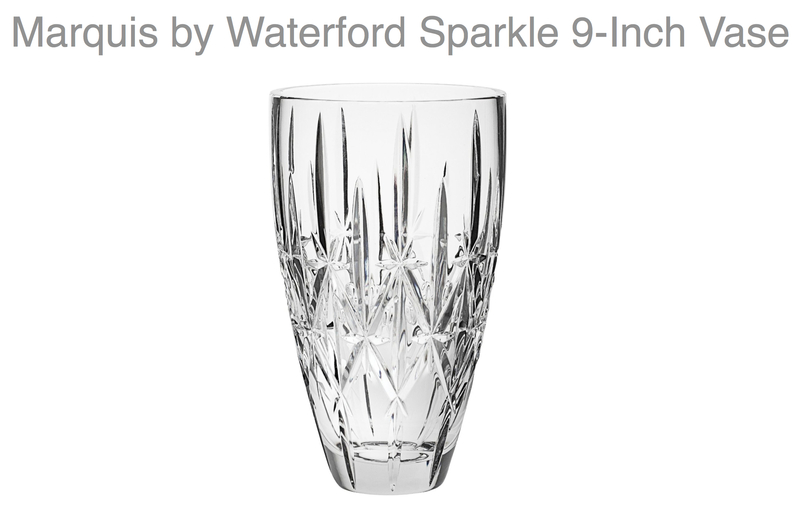 The Marquis by Waterford Sparkle Vase has brilliant cuts reminiscent of delicate starlight. Standing 9″ tall this vase is ideally shaped and sized for displaying fresh cut or dried flowers. Since it comes packaged in a Marquis by Waterford box it is not essential to spend the additional $5.99 for gift wrapping, however, we.do think that for this occasion gift wrapping is well worth the money. It will provide a polished, professional look and add that little extra celebratory WOW factor. 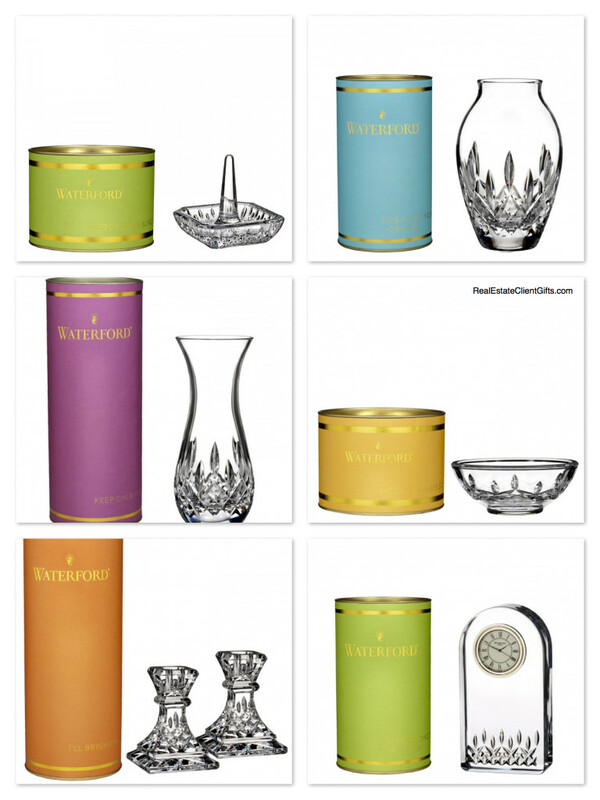 If you like this Waterford vase but prefer something a bit more upscale that is beautifully packaged and makes a WOW presentation, consider a gift from The Waterford Giftology Collection. 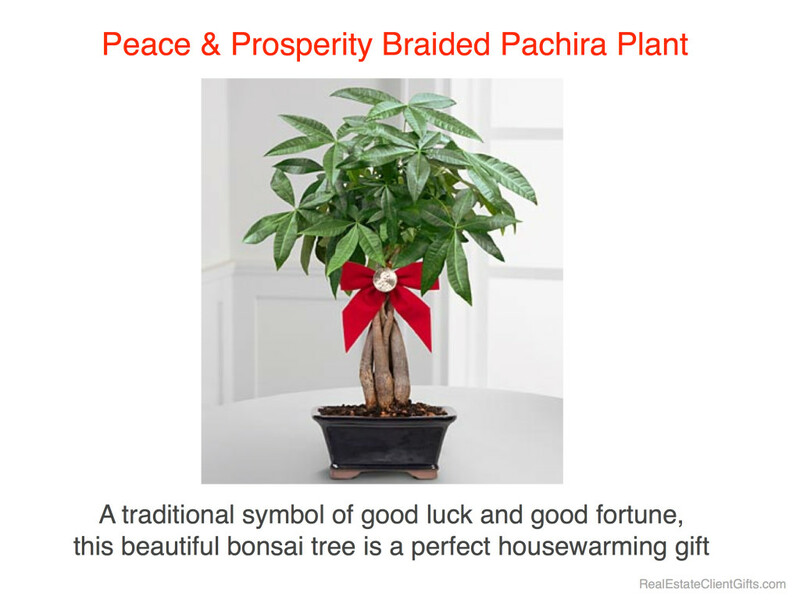 This Peace & Prosperity Braided Money Tree conveys heartfelt wishes for good fortune and serenity to the lucky recipient. Arriving planted in a square ceramic container and tied with a red bow displaying a lucky coin, this gift is one clients will enjoy for years to come! 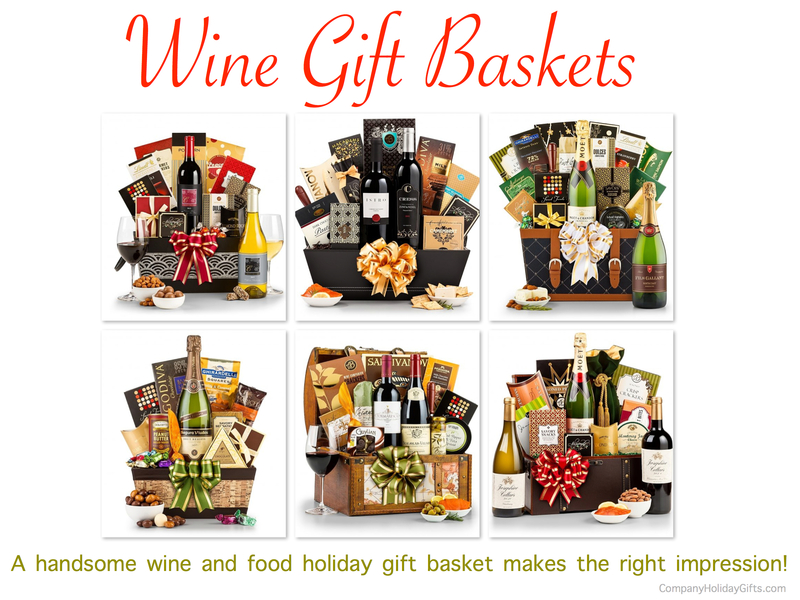 Choose any of these Holiday Wine and Food Gift Baskets and your clients will be more than impressed. 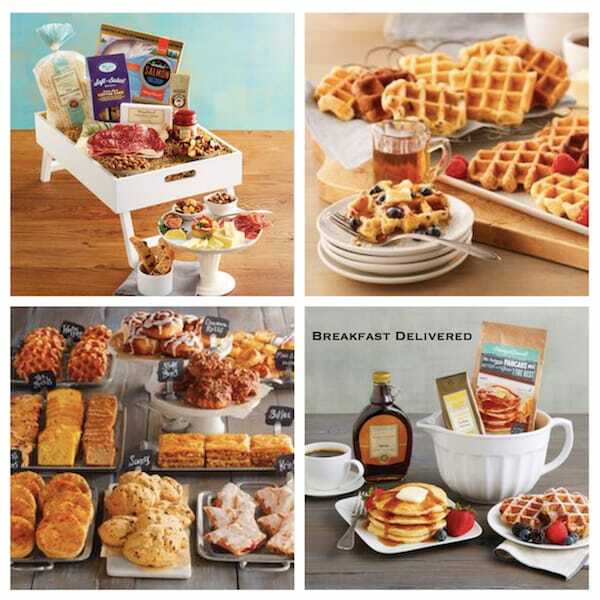 All the contents are delicious and the “basket” is so much more chic than a traditional wicker basket. 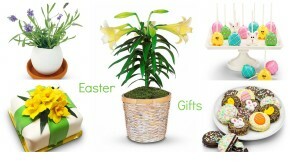 Gift contents & prices vary depending on the basket chosen. 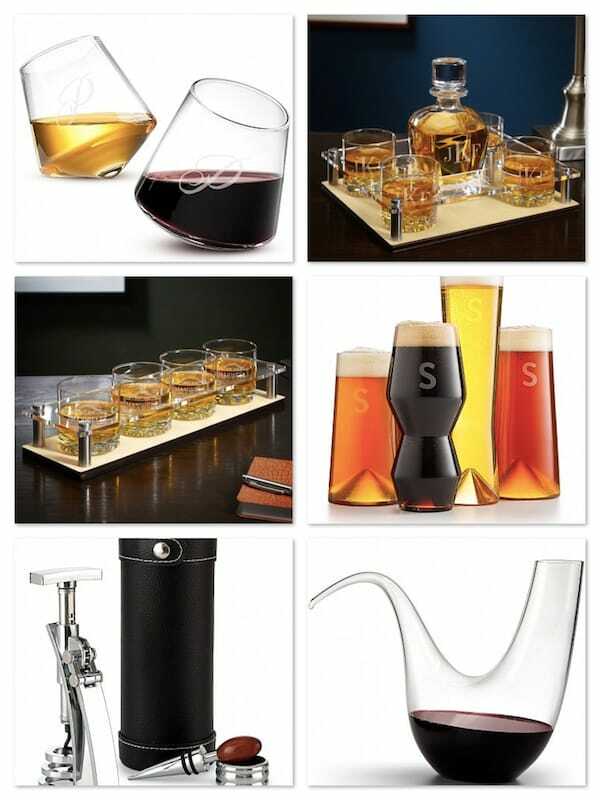 Whether your clients are mixing up a manhattan or pouring a glass of wine, the bone handles and elegant stainless steel of these tools are sure to add the perfect touch of sophistication to any home bar. 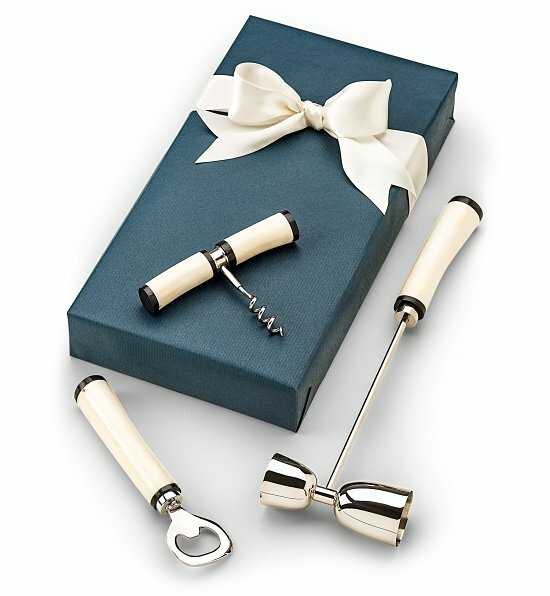 Distinguished and durable, this elegant set is a timeless gift, and the perfect addition to home entertaining. The Admiral Bar Set includes a jigger, corkscrew, and bottle opener. Consider adding a celebratory “starter” bottle to create that extra WOW factor. Entertain with a gorgeous, custom cheese board, crafted with the highest quality bamboo materials. With 4 different styles from which to choose, these cheese boards are the perfect harmony of bamboo, tempered glass, and stainless steel tools. Your custom designs will be printed in vibrant ink and adhered to the tempered glass for a unique and stunning entertainment piece. 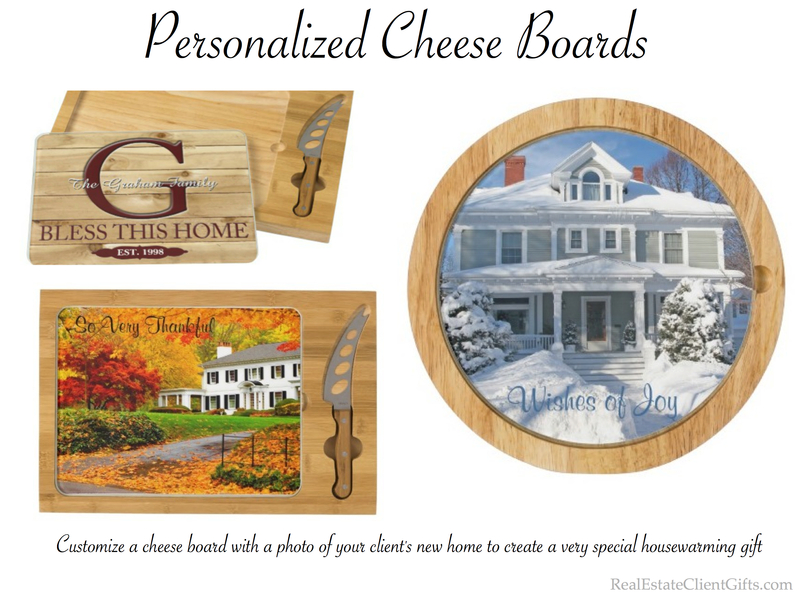 These cheese boards make a luxurious holiday gifts for very special clients. 11. For Your Golf Buddies! 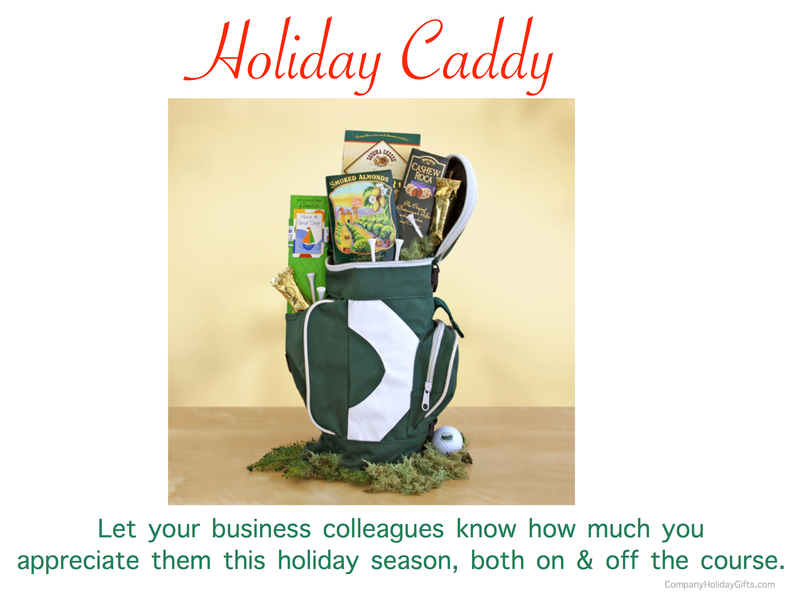 How fun would it be to send a Holiday Caddy to your business colleagues and clients who also happen to be your golfing buddies! For the client who is as comfortable on the links as he or she is grilling ’em up you must at least consider gifting this grill n’ golf BBQ tool set. 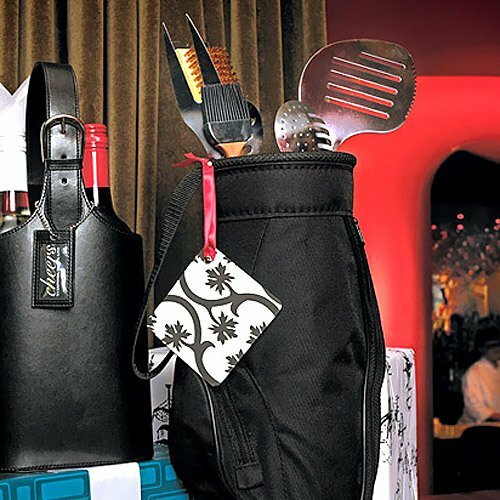 Each novelty grill set has five essential grilling tools stored in a golf bag-shaped holder. Click Here to Order a Grill and Golf BBQ Tool Set | More Great Golfer Gifts! 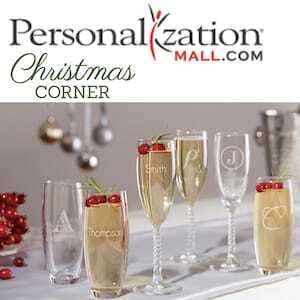 We are so excited to have discovered these truly fabulous gift wrapped tumblers from Refresh Glass. 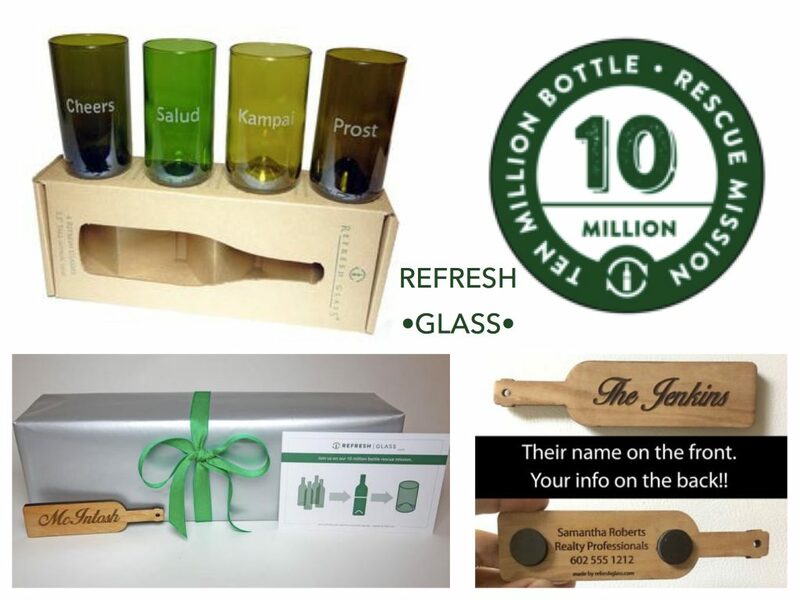 What makes them special is that Refresh Glass actively partners with the community to divert thousands of wine bottles every week that would have otherwise been thrown away, working towards their 10 Million Bottle Rescue Mission. Once collected they then transform the bottles into fun and functional glassware with a very industrial modern trendy aesthetic. We love the look and we love the fact that included in the gift is a custom engraved bamboo magnet. This gift truly is unique & special! 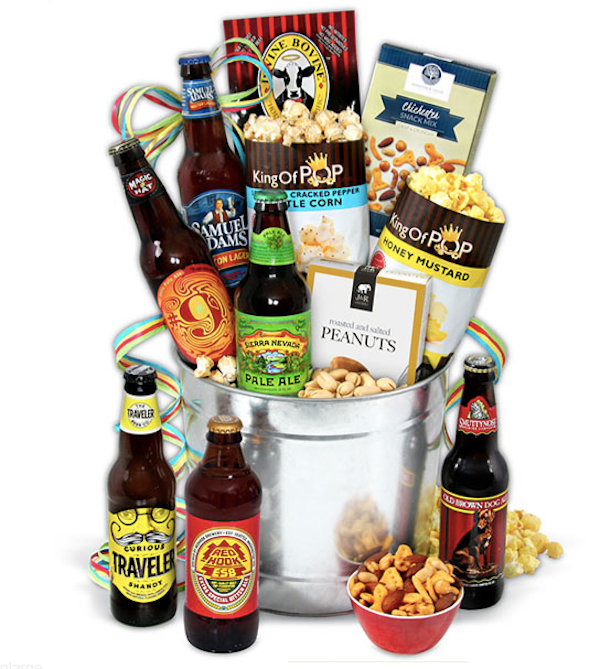 The ultimate gift for the beer lover, this large bucket holds your choice of premium beers as well as gourmet pub grub that highlight the distinct flavor of the brews. Choose between International Beers or American IPAs. Your clients will definitely appreciate your good taste and celebratory sentiments. 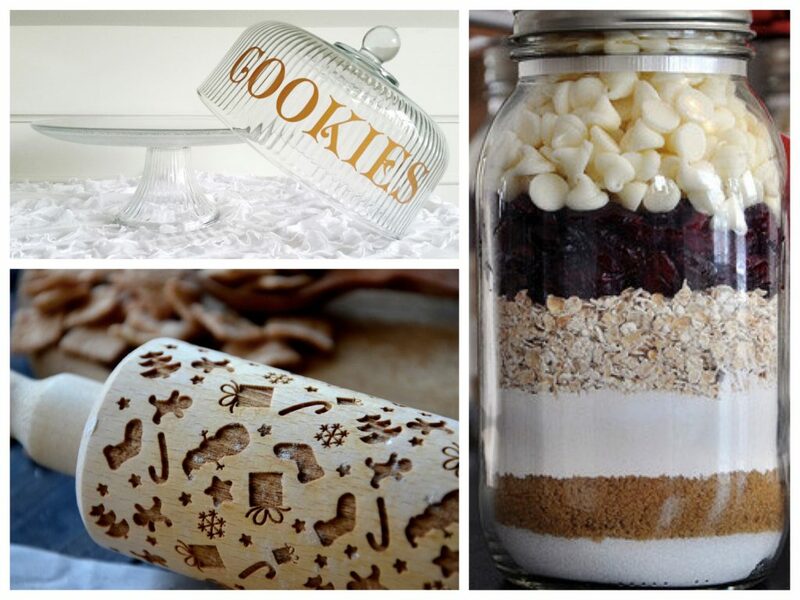 Help your clients create holiday memories with a festive DIY holiday cookie baking kit. Have all the items delivered to your office and then package them all together. 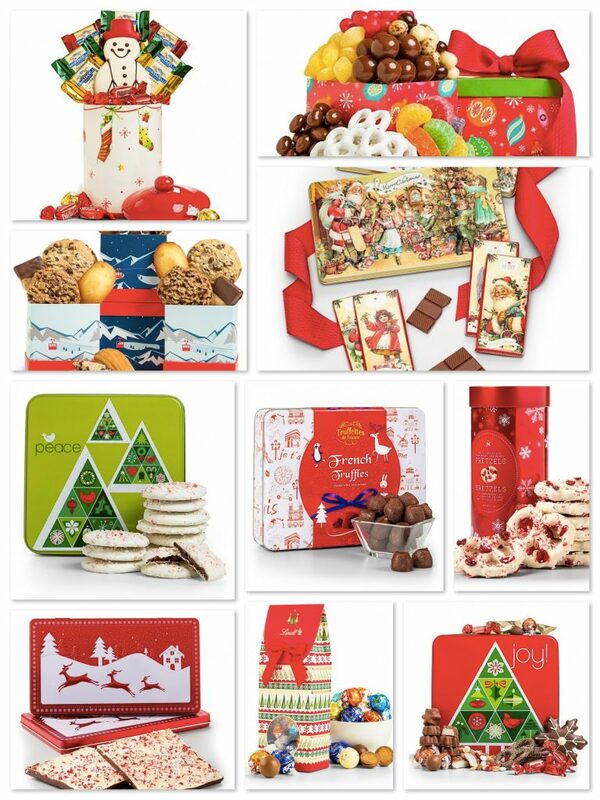 Deliver your holiday cookie baking kits to your clients’ and collegues’ doorsteps in the days before Christmas. 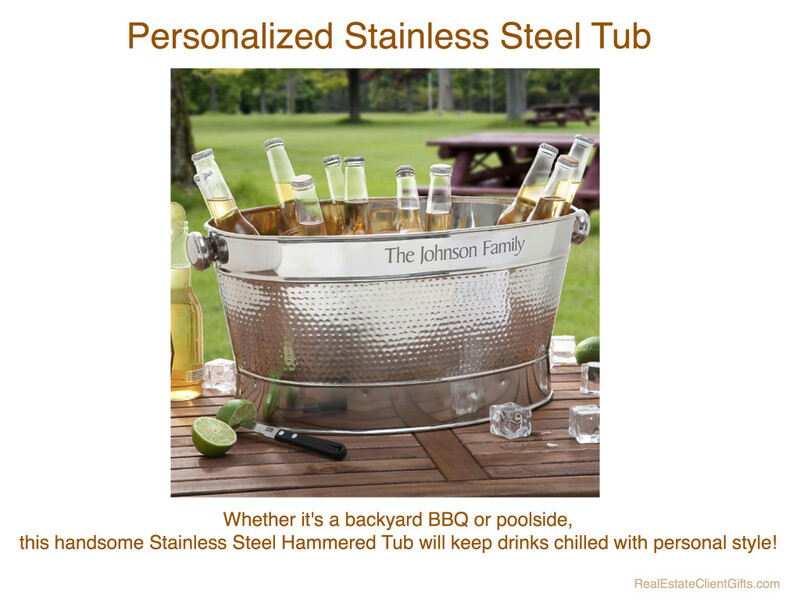 Personalize this stainless steel tub with your clients name skillfully etched into the top banner. This tub makes a unique housewarming gift that screams celebrate life in your new home! Fill with chilled drinks, flowers, or even fire wood. 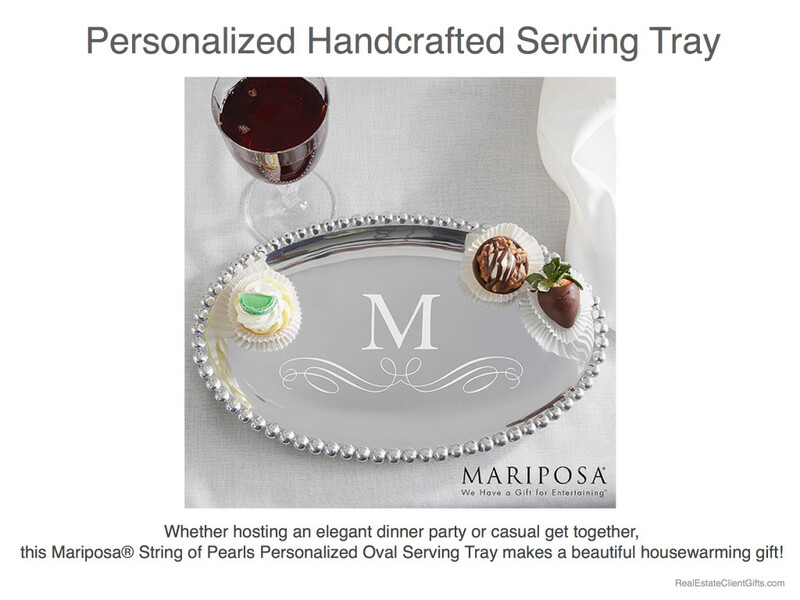 Personalize this serving tray with your client’s initial or name in a delicately etched, swirl design for a touch of class. Perfectly sized at 12 1/2″ L x 8 1/4″ H, this makes for an elegant appetizer or dessert serving tray and a lovely housewarming gift! 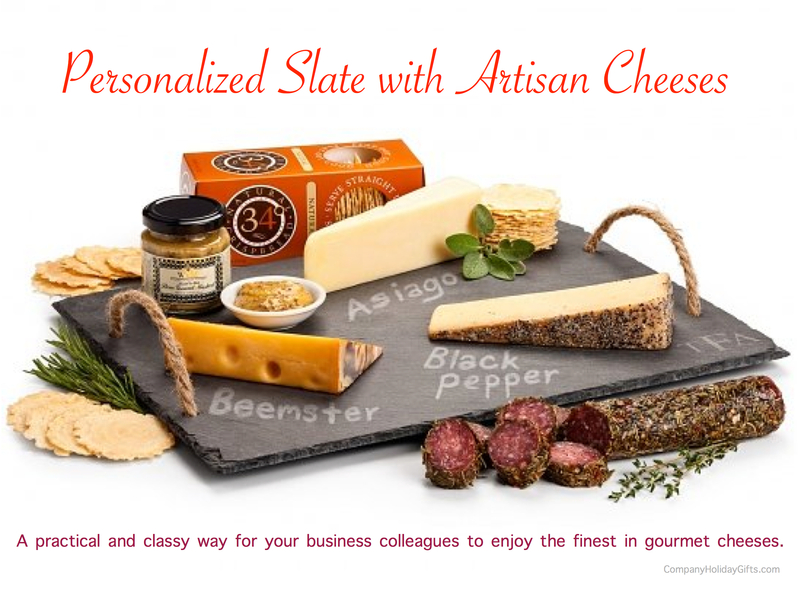 This beautiful stone slate cutting board features award-winning artisan-made cheeses from around the world including Sartori Basil & Olive Oil Asiago, Beemster Dutch Vlaskaas, and BellaVitano Wisconsin Black Pepper. Each gourmet cheese is paired with savory snacking selections including Tuscan Herb Salami, Flat Out Good Crispbread, and Willamette Valley Stone Ground Mustard. Each ingredient in GiftTree’s gourmet cheeses is chosen with an artisan’s eye for quality, and each cheese round is hand-rubbed with premium quality ingredients before aging to perfection. 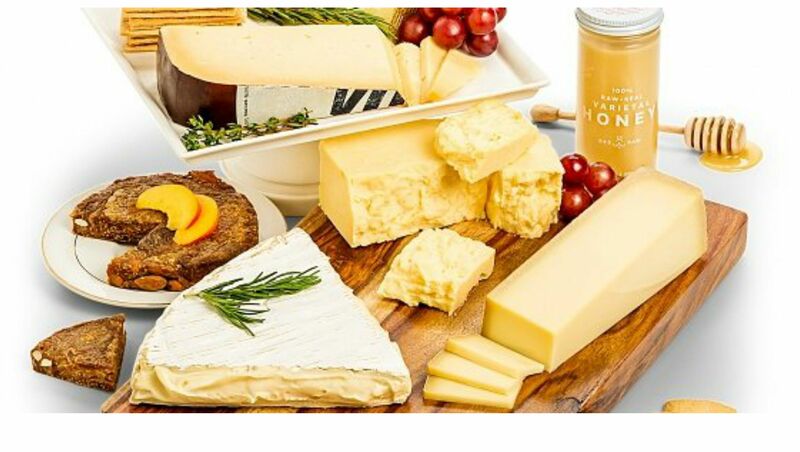 Many of their gourmet cheeses come from small, locally-owned dairies so you know you’re sending the highest quality possible, and GiftTree is proud to feature cheeses that earned prestigious gold, silver, and bronze medals from the American Cheese Society, the Wisconsin State Fair, and World Cheese Awards. The best part about a wine club is that this is a gift that keeps on giving. You stay in the forefront of your clients’ and colleagues minds every month for a an extended period of time! Our hands down favorite wine club is The California Wine Club. 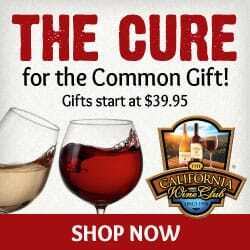 They specialize in hand-crafted California wines and artisan wineries. Month in and month out, their selection never disappoints! And they too are offering all sorts of specials this holiday season! 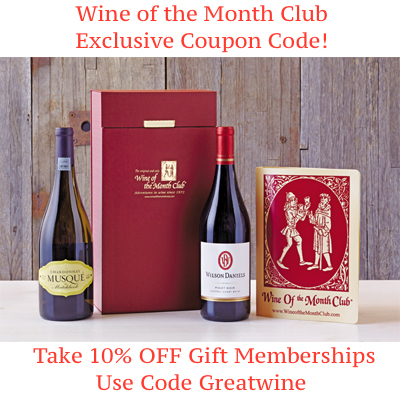 The California Wine Club is the same folks that paired holiday cookies and wine! We love this infographic! So even if you choose not to gift a wine club, definitely consider bundling a nice bottle of wine with a plate of homemade holiday cookies! An accessory that offers years of future use, this three-bottle wine tote is one of the most unique and beautiful ways to give the gift of wine. 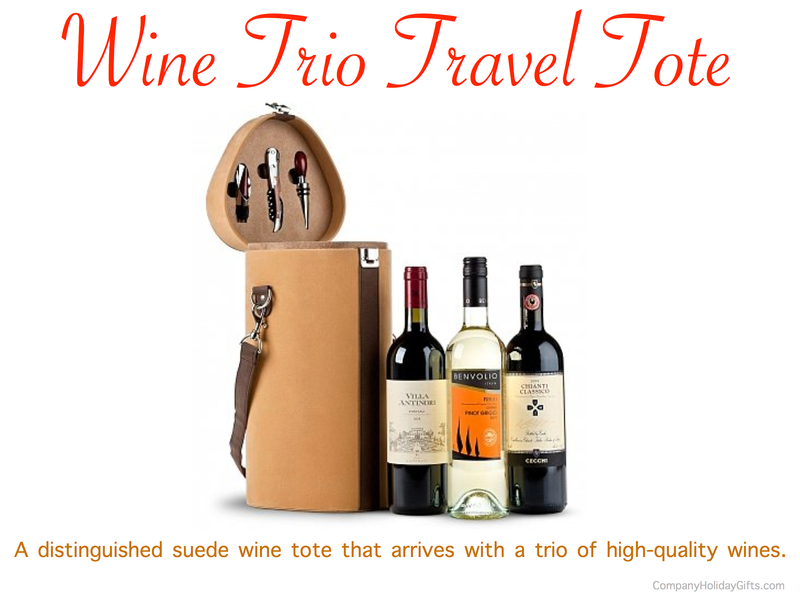 Tote holds your choice of wine trio, and features a detachable shoulder strap, inner partition to ensure safe transport, and a collection of sturdy wine tools. Truthfully, we sometimes prefer the simplicity of fine wine & fine leather to a huge basket full of “stuff”. 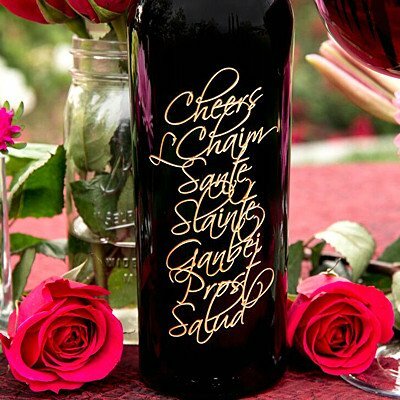 Click Here to Order Your Bottle of Cheers Etched Wine! 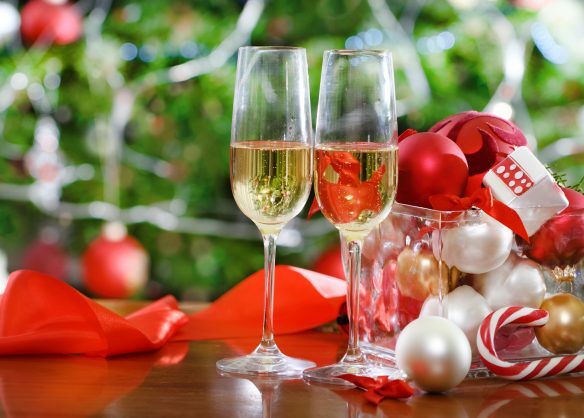 Ensure your clients toast to happy holidays & and joyful new year. 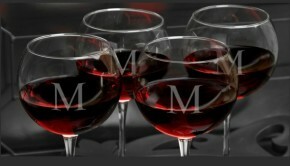 Choose from seven different wines and yes, the Mumm is just fine! 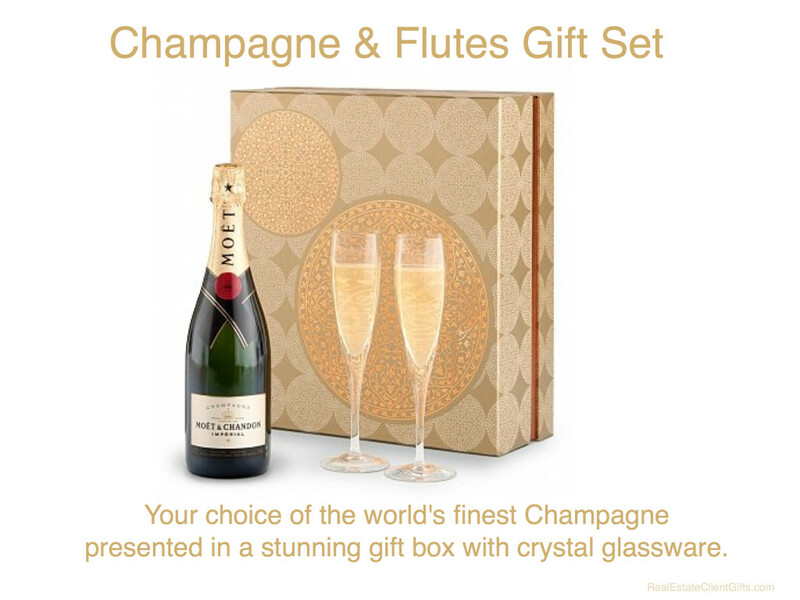 We particularly like that long after the sparkling wine is gone your clients will continue to enjoy their champagne flutes and will think of you every time they celebrate a happy occasion. Just want a simple bottle of champagne (no flutes)? 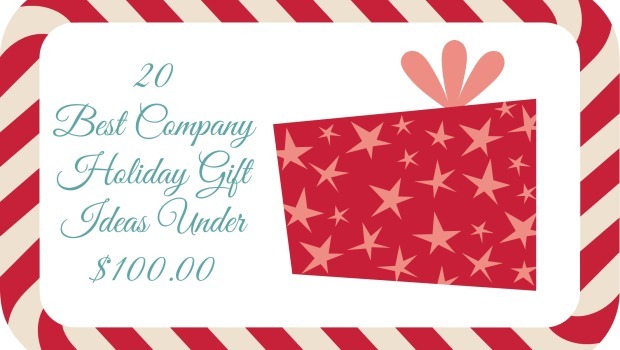 Summary: 20 Best Company Holiday Gift Ideas Under $100.00 - We have gathered together 20 of our favorite business holiday gifts that will be sure to impress and delight your business colleagues & clients. There are treats for individuals, couples, and the whole family! 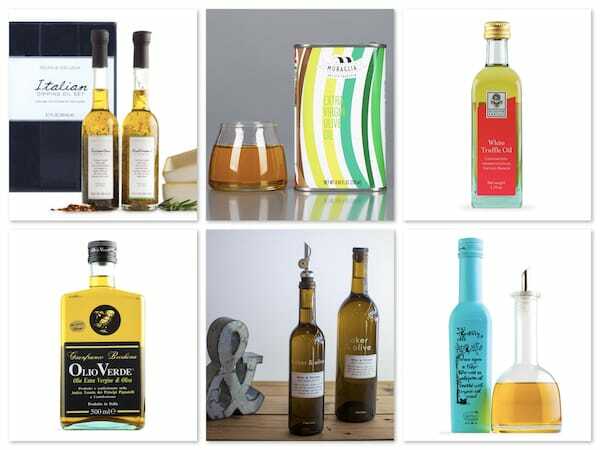 All the gifts have been hand selected to reflect high quality products with lovely presentation.